Although the temperature two weeks ago was a good 5-7 degrees warmer than this morning I found no reptiles during my first reptile survey of the year. However today with things colder and overcast the Common Lizards have obviously come out of hibernation as I found two on top of the tins and a further nine beneath. All were very torpid and I could easily have picked them up as they only moved off very slowly. Noticed about a dozen Common Frogs in my pond this afternoon but they all diasappeared as some Wood Pigeons came down to polish off the spilt seed from the feeders. Quite a lot of froggy activity in my pond after last night's rain but my Herp of the Day was a sun bathing Marsh Frog sitting at the edge of a pool at the London Wetland Centre., only about a metre away. Had my first Frog of the year last week, about 50 of them actually! Was great to see, lots of spawn there too. 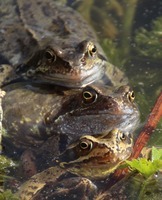 Though I didn't see them today I did hear the distinctive calls of Marsh Frogs today at Rainham. For the first time this year I found a decent sized slow worm basking in what little sun was available today. Saw my first Addet of the year today. A nice male under one of my survey tins at Bicton Common. Smooth Newts in my pond coming up for air + no doubt picking off newly emerged tadpoles. As I'm a sucker for Adder's even after nearly forty years of finding them, so here is my reptile of the day (surprise! Surprise!) it's a male Adder that was under a survey tin at Colaton Raleigh Common this morning. That's a great looking snake Kimi. The markings look very bright and well defined. Do snakes slough soon after coming out of hibernation? They do usually slough after hibernation although the one in my picture has yet to do so. If you look at an expanded view of the picture you can see its eye is milky blue which is a sure sign that it's about to slough it's skin. As you say it's a great looking snake already so I guess it'll be even better looking soon. Have had daily herp sightings this week with Stripe-necked Terrapins, European Pond Terrapin, European Glass Lizard, Snake-eyed Lizards + my two stars: Starred Agamas + Balkan Green Lizards. Saw the first tads swimming about in the pond today- still very tiny, but finally hatched!